As we close out the National Park Service Centennial and celebrate colors of our National Parks, we turn our attention to celebrating parks and trails by exploring soil art. A good place to learn about soil color is through art. Susan Southard is a soil scientist with the Natural Resources Conservation Service in Davis, California. She has worked for nearly 40 years as a university, state and federal employee of the National Cooperative Soil Survey. In the last nine years she has been assisting the National Park Service in completing soil inventories of 250 NPS properties. She completed a BS degree with a concentration in soil science from the University of Rhode Island and post-graduate classwork from North Carolina State University and the University of California at Davis. Lewis and Clark National Historic Trail, established by Congress in 1978 as part of the National Trails System (NTS) is one of four original national historic trails. It is administered by the National Park Service. It is the approximate route the Corps of Discovery took from the central plains to the Pacific and back. It is a collaborative effort of many local, county, state, and federal agencies to preserve a continuous 3,700 mile long trail through 11 states and tribal lands. The trail is approximate as river courses have shifted or have been dammed. The National trail is by land and water, and is anchored by two NPS properties. 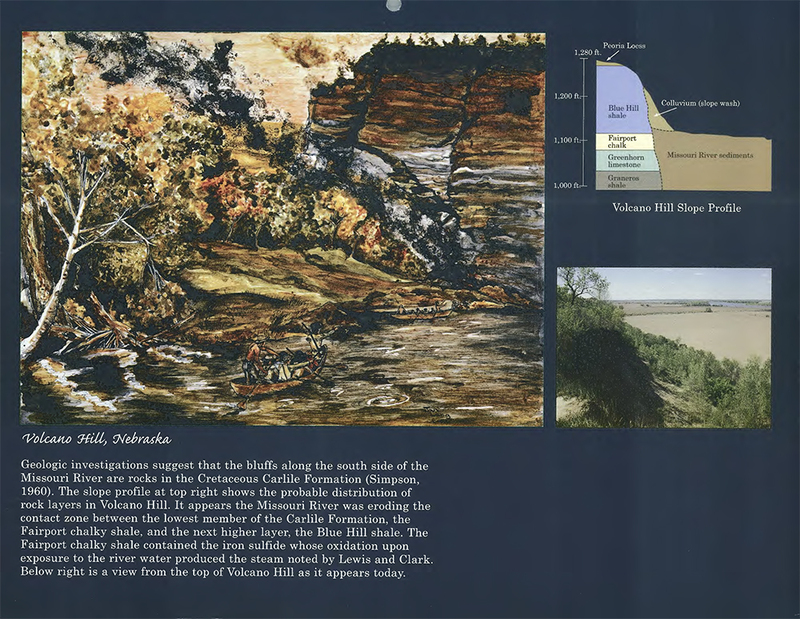 On the east is the NPS Jefferson Historic Expansion Memorial in St Louis, Missouri and on the west end is the Lewis and Clark National Historic Park. Discover 3,303 acres of unique heritage along the Columbia River and Pacific Ocean. Rich soil provides homes to more than 250 plant species and 74 mosses along rows of tall spruce trees. Lewis and Clark National Park hosts diverse habitats, from coastal rain forests to swamp wetlands in preserved areas. Lewis and Clark portraits by Janis Lang using soil paint. Fluctuating water tables in soil create different colors. When the water table becomes deeper in the soil during a dry season, oxygen reenters the soil that was saturated during the wet season. Soluble iron oxidizes into characteristic orange colored mottles of lepidocrocite as seen in this painting. Lepidocrocite has the same formula as goethite but a different crystal structure. If the soil aerates rapidly, bright red mottles of ferrihydrite may form in pores and on cracks, however ferrihydrite is not stable and, in time, alters to lepidocrocite. Janis Lang is a lab technician who works at the USDA’s Kellogg Soil Survey Laboratory in Lincoln, NE where she has supported soil survey and conservation efforts. Janis took her long standing respect for the land and combined it with her love of art and painting by turning soil into a paint. With no formal art training, Jan began painting in 1991, but it didn’t take long for her to form the idea of taking the material she works with every day—soil—and develop a method that turns soil into paint. Soil paint makes her paintings not only beautiful but unique. 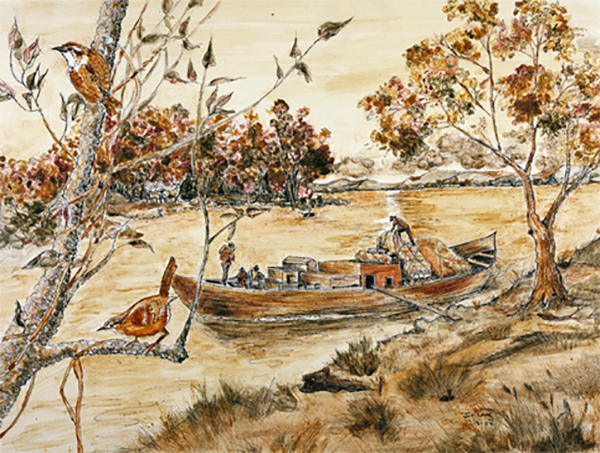 A series of paintings Janis created of the Lewis and Clark Corps of Discovery (Lewis and Clark Expedition Members) is well known among soil scientists who have worked with Janis. It didn’t take long for her to form the idea of taking the material she works with every day—soil—and develop a method that turns soil into paint, making her paintings not only beautiful but unique. Image Above: Along the shores of the Missouri River Corps members load supplies and expedition specimens on to their boat. Relatively large crystals of goethite, found in well-drained soils, lend a yellow color to the paint. 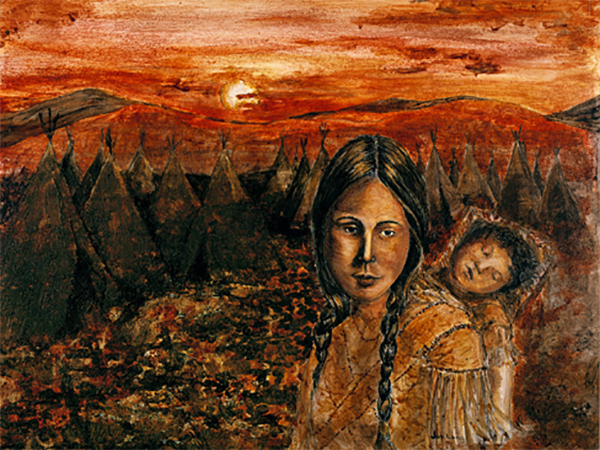 Image Above: Sacagawea and her son travelled with the Lewis and Clark expedition. Hematite colors (in the sky of this painting) are more prevalent in warmer climates or where soil has preserved a record of warmer climates from earlier geologic times. Hematite (Greek for blood-like) adds rich red tints. In general, goethite soil colors occur more frequently in temperate climates, and the smaller goethite crystals produce shades of brown. Large hematite crystals give a purplish-red color to geologic sediments that, in a soil, may be inherited from the geologic parent material. Janis’ soil art process is fairly simple. Soils of various colors are gathered and allowed to dry individually. Janis used soil samples from all over the country sent to the lab for characterization. Each dried soil sample is crushed into a refined powder, first by using a hammer or mallet and then moving onto a mortar and pestle until the soil becomes extremely fine material. Then each finely ground soil sample is placed in its own paper cup creating a color palette. Using another set of paper cups, a small amount of artist acrylic is poured into each cup, then small amounts of the fine soil are added to develop the colors and desired consistency. This process ultimately creates a choice of colors that truly represent the natural resources that Jan loves to paint. Her paintings have garnered praise and attention from the public and art community. 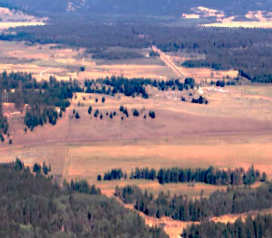 Image Above: The Corps of Discovery crossing the Continental Divide along the Lewis and Clark Trail. 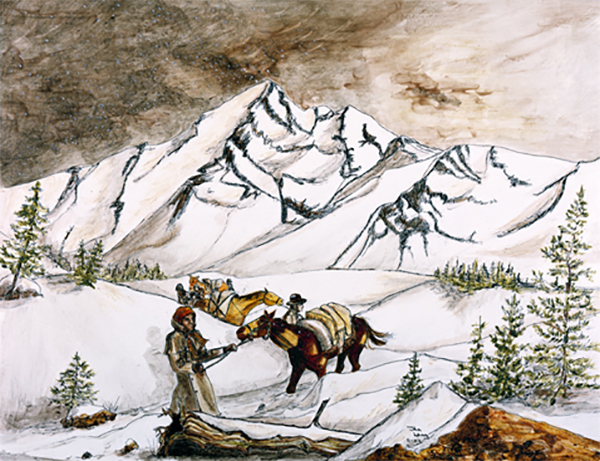 The use of soils high in calcite or dolomite create the white colors seen in the snow of this painting. Soils with high humus content help outline the mountains in black. Manganese-containing minerals also can impart black colors in soil. 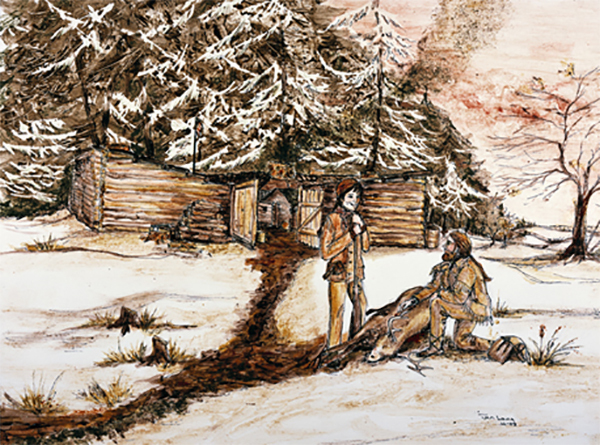 Image Above: Fort Clatsop, shown here in this painting by Janis Lang, is a unit of the NPS Lewis and Clark National Historic Park. Located near the Pacific Ocean and the mouth of the Columbia River, the Corps of Discovery encamped here during the winter of 1805-1806. Fort Clatsop was named after a local Indian tribe. What soil minerals do you think are used in this painting? Image Left: Jan, in a way to give back to her work environment, offered to paint three murals, one on each of the National Soil Survey Center’s main structural columns. 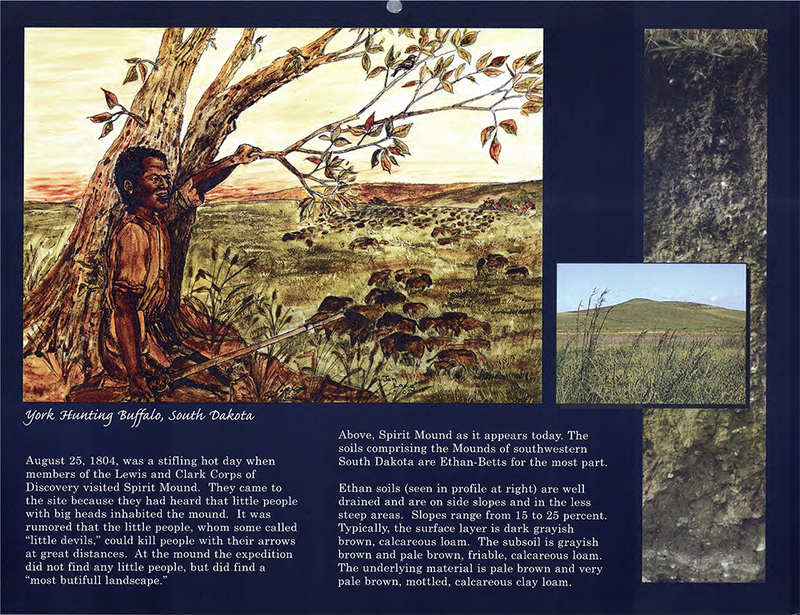 Each mural depicts a different area of the country in relationship to the soil and the area’s natural resources. For this column Janis relied on acrylic paints.